This chapter describes the (software) architecture of the Smart Emission Data (Distribution) Platform. A recent presentation (PDF) and this paper also may give more insight. 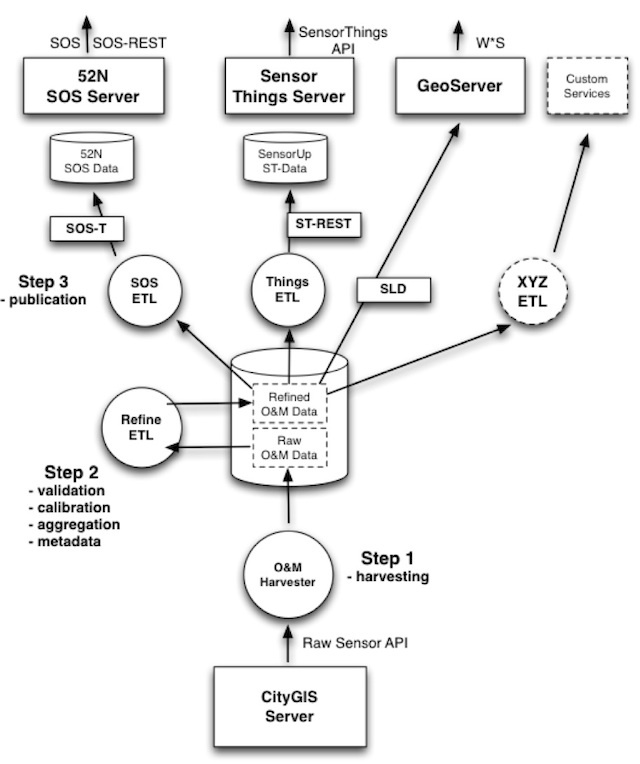 This section sketches “the big picture”: how the Smart Emission Data Platform fits into an overall/global architecture from sensor to citizen as depicted in Figure 1a and 1b below. Some details for the Intemo Josene: The sensor installation is connected to a power supply and to the Internet. Internet connection is made by WIFI or telecommunication network (using a GSM chip). The data streams are sent encrypted to a Data Collector (see above). The encrypted data is decrypted by a dedicated “Jose Input Service” that also inserts the data streams into a MongoDB or InfluxDB database using JSON. This database is the source production database where all raw sensor data streams of the Jose Sensor installation are stored. 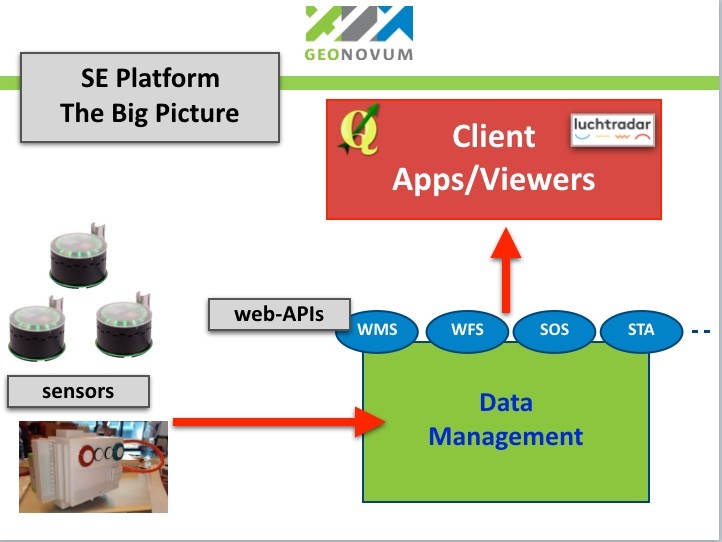 A dedicated REST API – the Raw Sensor API nicknamed the Whale API - is developed by CityGIS and Geonovum for further distribution of the SE data to other platforms. 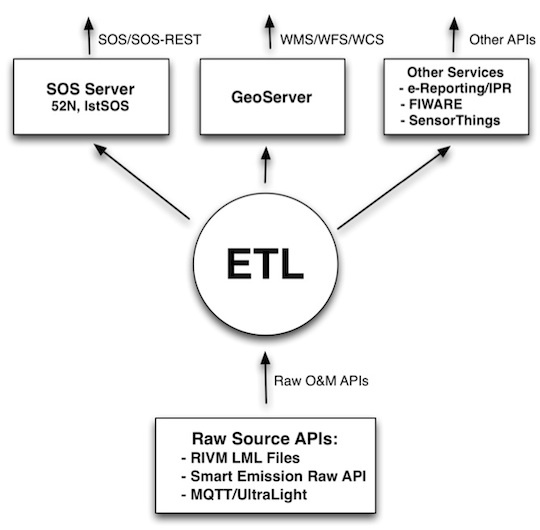 In order to store the relevant SE data in the distribution database harvesting and pre-processing of the raw sensor data (from the CityGIS and Intemo Data Collectors) is performed. First, every N minutes a harvesting mechanism collects sensor-data from the Data Collectors using the Raw Sensor API. The data encoded in JSON is then processed by a multi-step ETL-based pre-processing mechanism. In several steps the data streams are transformed to the Postgres/PostGIS database. For instance, pre-processing is done specifically for the raw data from the air quality sensors. Based on a calibration activity in de SE project, the raw data from the air quality sensors is transformed to ‘better interpretable’ values. Post-processing is the activity to transform the pre-processed values into new types of data using statistics (aggregations), spatial interpolations, etc.. 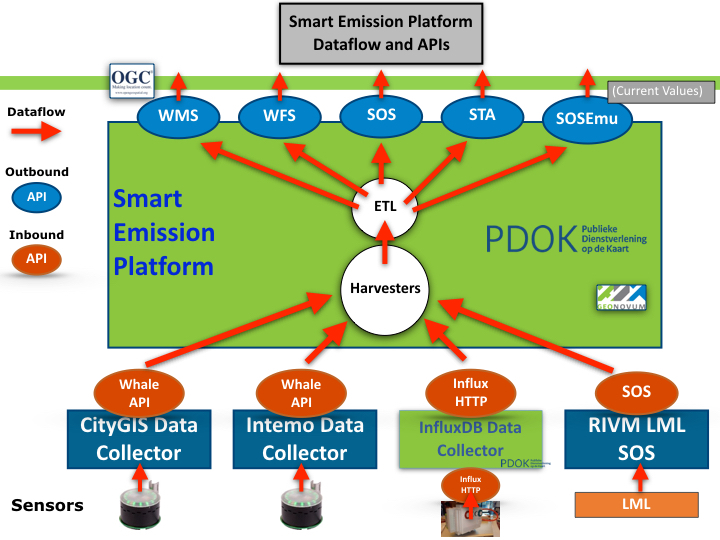 The design of the Smart Emission Data Platform, mainly the ETL design, is further expanded below. Figure 2 below sketches the overall architecture with an emphasis on the flow of data (arrows). Circles depict harvesting/ETL processes. Server-instances are in rectangles. Datastores the “DB”-cons. This global architecture is elaborated in more detail below. Figure 3 sketches a multistep-ETL approach as used within the SOSPilot project. Here Dutch Open Air Quality Data provided through web services by RIVM (LML) was gathered and offered via OGC SOS and W*S services in three steps: Harvesting, Preprocessing and Publishing, the latter e.g. via SOS-T(ransactional). The main difference/extension to RIVM LML ETL processing is that the Smart Emission raw O&M data is not yet validated (e.g. has outliers), calibrated and aggregated (e.g. no hourly averages). Also we need to cater for publication to the Sensor Things API Server (STA GOST)). Step 2: Refiner: validate, calibrate and aggregate the Raw O&M Data, rendering Refined O&M Data with metadata. The datastore is Postgres with PostGIS. Step 3: Publisher. Publish to various services, some having internal (PostGIS) datastores. The SOS ETL process transforms refined O&M data to SOS Observations and publishes these via the SOS-T InsertObservation service. Stations are published once via the InsertSensor service. Each ETL-process applies “progress-tracking” by maintaining persistent checkpoint data. Consequently a process always knows where to resume, even after its (cron)job has been stopped or canceled. All processes can even be replayed from time zero. Docker is the main building block for the SE Data Platform deployment architecture. Docker …allows you to package an application with all of its dependencies into a standardized unit for software development.. Read more on https://docs.docker.com. The details of Docker are not discussed here, there are ample sources on the web. One of the best, if not the best, introductory books on Docker is The Docker Book. The SE Platform can be completely deployed using either Docker Compose or using Docker Kubernetes (K8s, abbreviated). The platform hosted via PDOK is using K8s. let each Docker image perform a single (server) task: Apache2, GeoServer, PostGIS, 52NSOS etc. The Docker Containers as sketched in Figure 4 are deployed. 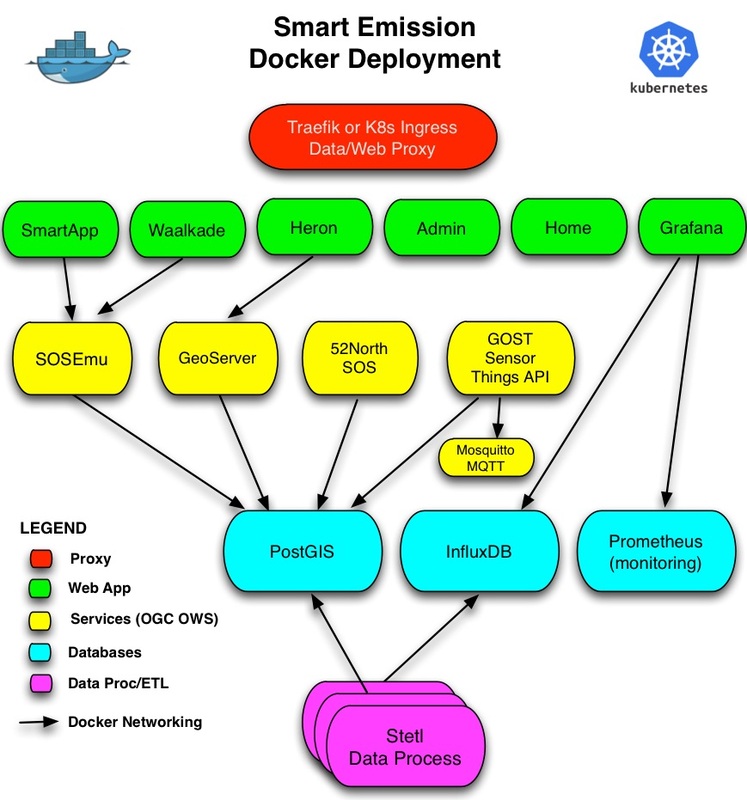 The Docker Networking capabilities of Docker will be applied to link Docker Containers, for example to link GeoServer and the other application servers to PostGIS. Docker Networking may be even applied (VM-) location independent, thus when required Containers may be distributed over VM-instances. Initially all data, logging, configuration and custom code/(web)content was maintained Local, i.e. on the host, outside Docker Containers/images. This will made the Docker Containers less reusable. Later, during PDOK migration, most Docker Images were made self-contained as much as possible. An Administrative Docker Component is also present. Code, content and configuration is maintained/synced in/with GitHub (see below). Docker Images are available publicly via Docker Hub. The list of Docker-based components is available in the Components chapter. See https://github.com/smartemission for the generic Docker images. In order to provide a continuous/uninterrupted service both a Test and Production deployment has been setup. For local development on PC/Mac/Linux a Vagrant environment with Docker can be setup. The Test and Production environments have separate IP-adresses and domains: test.smartemission.nl and data.smartemission.nl respectively. The challenge is to monitor services contained in Docker. 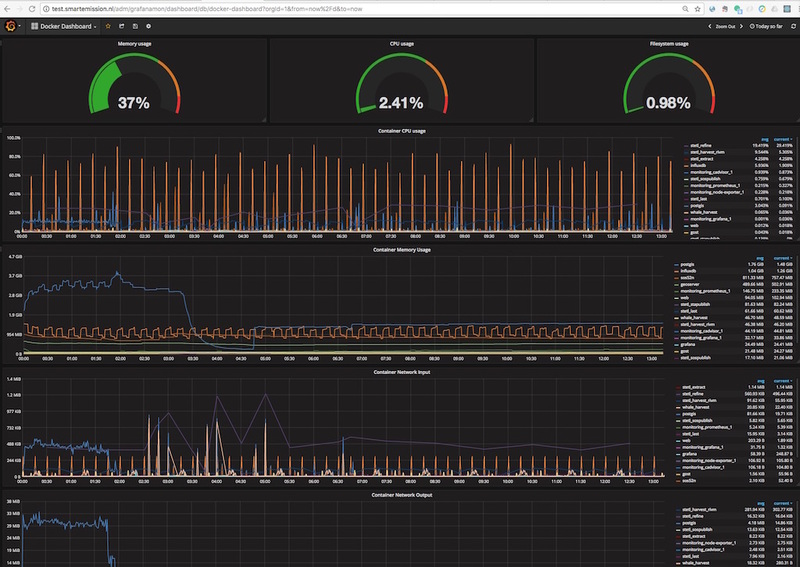 Monitoring is based around Prometheus and a dedicated (for monitoring) Grafana instance. A complete monitoring stack is deployed via docker-compose based on the Docker Monitoring Project. In the future this approach by Stefan Prodan is worthwhile.